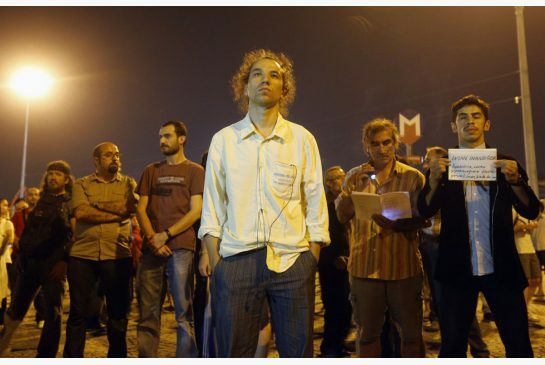 Turkey’s standing man is uniquely individual, even casual within the gallery of non-violent acts of resistance. It’s hard to say what’s so moving about him. He stands, sleeves rolled up, hands in pants pockets, gazing (in the original version) at a portrait of modern Turkey’s founder, Kemal Ataturk, clearly pondering it — for eight hours. It’s not overtly defiant but it is defiantly undeferential. It has nothing of other forms of public standing, e.g., at attention; or fans raptly waiting to see pop stars. It’s a counterpoint to those, it has that pensive quality, of citizens thinking about what’s happening around them: Power Beware. It’s nonconfrontational yet it’s utterly committed. Performance artist Erdem Gunduz makes a statement by just standing in a public place. Turkey’s “standing man” protester, created by performance artist Erdem Gunduz, is a brilliant addition to the iconography of non-violence. It’s not a long list. The image catalogue of aggressive resistance is much longer. It includes the knight errant on his horse, with a lance; the lone rider in the old west; the private eye pacing the mean streets, taking down crime and corruption; the guerrilla fighter in the hills. They all pack weapons. Gunduz had only a backpack and when the cops checked inside, whatever they found was harmless. One predecessor to him is the picket line, especially during the last global depression, in the 1930s. We forget how picket lines were once spontaneous, even romantic; they’ve been legalized and bureaucratized, which was a victory for workers but also damped down the energy and creativity involved and put them under control of union leaders; they became less a raw expression of the urgent moral claims of workers. The place where that spirit still lives is China, where illegal (and usually unreported) “wildcats” break out every day. Or there were the sit-ins of the civil rights movement of the 1960s, which were inspired by the sit-down strikes of the ’30s. When Martin Luther King Jr. was murdered in 1968, he was in Memphis forging a connection between a strike by city workers and the civil rights movement. Another precursor was the Gandhian movement in India: ranks of protesters silently moving up to be clubbed senseless by the British imperial forces. Non-violence may do without weapons but it’s menacing and implacable, that’s the whole point. Turkey’s standing man is uniquely individual, even casual within this gallery. It’s hard to say what’s so moving about him. He stands, sleeves rolled up, hands in pants pockets, gazing (in the original version) at a portrait of modern Turkey’s founder, Kemal Ataturk, clearly pondering it — for eight hours. It’s not overtly defiant but it is defiantly undeferential. It has nothing of other forms of public standing, e.g., at attention; or fans raptly waiting to see pop stars. It’s a counterpoint to those, it has that pensive quality, of citizens thinking about what’s happening around them: Power Beware. It’s nonconfrontational yet it’s utterly committed. It’s like Martin Luther’s (of the Protestant Reformation) Here I stand, I can do no other. Or, at least for me, the Biblical Hineini, “Here I am”: the reply made by every figure — Abraham, Moses, Samuel and many others — when they were called to respond to the need of the moment. He’s totally alone and self-sufficient yet paradoxically that seems to be what allowed others to identify and create copycat versions, which in effect became the secret code of a mass movement. There’s something cinematic and contemporary with which others can connect: a touch of 1950s method acting — Brando, James Dean or Steve McQueen (or Belmondo in the European version) grown ubiquitous by now in figures like Brad Pitt, Ryan Gosling, James Franco. Maybe that’s why it’s been so easily and effectively adopted. It seems appropriate that he appeared the week after Edward Snowden, another young man, stood up alone and exposed the levels of surveillance done by the state in alliance with corporate technological forces embodied in the Internet — itself once a symbol of freedom and individuality. Maybe that was in his mind consciously or just in the air, in the collective unconscious. Standing man typifies Snowden and also Bradley Manning— taking a stand. Their weakness is their aloneness; change is made by organized groups. Yet the value of a symbol is that it helps like-minded people find each other (as does the Internet). Plus it confuses the authorities. You can imagine the first cop who called this in: There’s somebody in the square again. What’s he doing? Standing. That’s it? Yeah. Maybe you should come down and have a look. So they check the backpack, nothing there. The guy is still just standing, apparently thinking about the portrait of Ataturk and political . . . stuff. Can you roust him for that? Eventually the vice-president of Turkey tells them to back off, this could only make things worse. And others, then, start standing up too. This entry was posted in Artistic Protests, Dance / Performance, Essays and tagged Bradley Manning, civil rights movement, Edward Snowden, Erdem Gunduz, non-violent resistance, Performance artists on 21 June 2013 .